With the festive season just around the corner, promoters are pulling all the stops to bring the world’s best talent to Mzansi. And next month, the We Are House crew host the powerhouse German DJ and producer Patrick Zigon. Hailing from the beautiful German Lake Constance region, Zigon is more inspired by landscapes, nature and his environment, than musical hype. This inspiration has helped create an organic sound—paying extra attention to the sound design and atmosphere of his songs. His unique approach to music can be heard in his catalogue of over 400 releases since 2003 on labels like ViVa Music, Cocoon and Compost. And with support from the likes of Steve Lawler, Guy Gerber and Gui Boratto, it’s clear that Patrick Zigon has made his mark on the dance music industry. 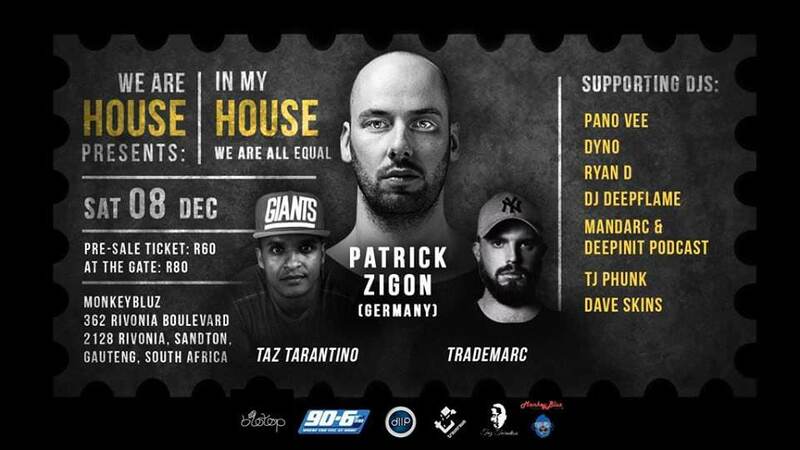 Patrick Zigon heads to MonkeyBluz in Rivonia on December 8th, with support from Trademarc, Taz Tarantino and more.